I am happy to share, our third definitive handbook series book – Real Artificial Intelligence is available for pre order on Amazon. Our aim in this book is to provide a real view of AI, where it exists today and what we can achieve in future. • If we have all the data, can AI help to build any possible solution? • Can AI platforms developed for solving quiz, solve cancer problems? • Does an AI platform learn on its own? • Can we build Enterprise AI solutions by just using AI, ML and Cognitive services from cloud vendor? • Is today’s generation of chatbots a glorified version of if–then-else-entity based rules? • Does a true Investment AI assistant exist today? • Is general intelligence a reality or myth? • Is there a recipe to build a successful AI project? • Will AI ever take away jobs ? and a recipe for building any real-world application using the latest technology. Real AI would be a series of book. 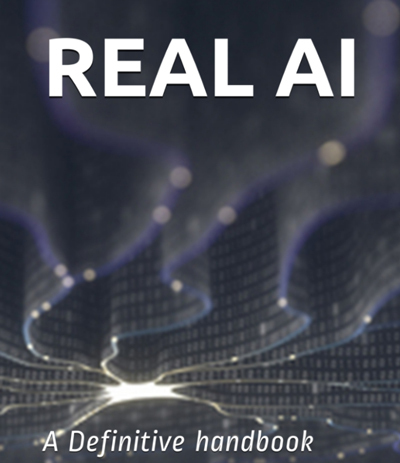 Volume 1 of Real AI, planned to be released in August 2018, would focus on applying AI for computer vision technology using a real-world use case. Generative Adversarial Network (GAN) is class of deep learning algorithm, comprising of 2 networks – a generator and discriminator, both competing against each other to solve a goal. For instance, for image generation, the generator goal is to generate real like images which discriminator can’t classify as a fake or unreal image. The discriminator goal is to classify real images from fake ones. Initially the generator network would start off from blank images and keep on generating better images after each iteration, up to a point it start generating real like images. The discriminator network would take an input of real images and the images provided by the generator network and classifies the image as real or fake, up to a point where generator start generating real like images which is hard for the discriminator to discriminate. The same algorithm is being applied in other domains also. However, based on my experiments, lot of optimization need to happen for large image sizes. I had to create a custom generator/discriminator network to work against input size of 128*128 and 256*256 image pixels and lot of iterations to generate real-like images. The training data used was of Indian Bird. Here is a snippet of my talk on GAN at the Eclipse Summit Conference, which demonstrates the experiment. My technical talk at IoTNext, where I talked about applying intelligence at the edge gateway and cloud. Topics covered – Deep Learning, Computer Vision at the Edge Gateway for security and surveillance, Cognitive IoT – Cognitive Cricket and Connected Car and Security and Trust compliance using Blockchain as a service.